The Automatic Identification System (AIS) enables ships to see and identify other nearby vessel traffic. In the same way that aircraft broadcast information about themselves to air traffic controllers, ships with dedicated VHF AIS transceivers can transmit and receive ship information, such as ship size, draft, position, speed, direction, cargo, destination and other information. Ships equipped with an AIS-enabled display can see the positions of other ships up to 20 nautical miles away, even if they are behind islands or other obstructions that may block radar. The U.S. Coast Guard provides more information about AIS. How is AIS used on aids to navigation? 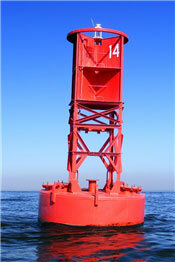 AIS transmitters can also be affixed to a floating or fixed aid to navigation (ATON), such as a buoy, beacon, or light. 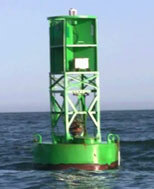 The AIS broadcast provides the position and purpose of an aid, such as a port or starboard lateral buoy, even before it is close enough to be visible from a ship or to provide a radar return. This can help mariners confirm their ship's position or to prepare to make a turn that is based on passing a particular aid. Real AIS ATON – A physical aid to navigation structure on which an AIS transmitter is affixed and from which AIS messages are broadcast. Synthetic AIS ATON – A physical aid to navigation structure, without an AIS transmitter, but for which AIS messages are broadcast from another (usually land-based) location. Virtual AIS ATON – An aid to navigation with no physical structure. It exists only through AIS messages broadcast from another location. A few uses of virtual ATONs include environments where buoys are moved seasonally, such as in sea ice, or where a marker needs to be placed quickly, such as to mark a newly identified isolated danger or wreck. 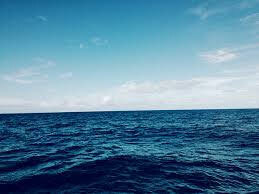 These aids can only be seen on an Electronic Chart Display and Information System (ECDIS), or other AIS enabled display, such as a ship’s radar. 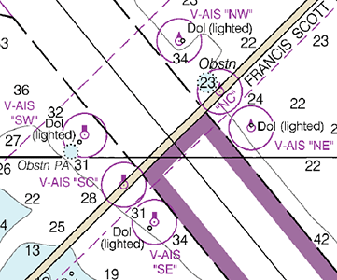 AIS ATONs on NOAA nautical charts are portrayed with a magenta circle, enclosing an ATON symbol. The same symbol is used to depict both real and synthetic AIS ATONs, with a magenta “AIS” label next to the circle. Virtual AIS ATONs have a “V-AIS” label. The table below shows examples of how non-AIS and AIS ATONs are shown on NOAA nautical charts. window of a ship's bridge. * These examples are based on the IALA-B buoyage system that is used in North and South America. In the IALA-A system, used in U.S. territories in the South Pacific, the square and triangle top marks shown on V-AIS aids are switched with each other. Refer to the graphic at Q-130.1 in U.S. Chart No.1 for more information about IALA buoyage regions. 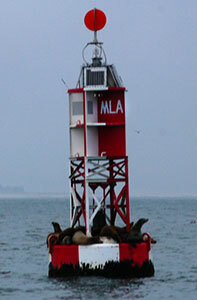 The USCG Light List also identifies AIS aids. For example, for this safe water mark , the USCG light list entry provides information regarding the AIS message in the remarks column, as shown below. ECDIS and NOAA paper nautical charts portrayal of the most common types of virtual AIS aids are shown in the table below. What do virtual AIS ATONs look like in navigation systems? The images below show examples of how three different navigation systems represent virtual AIS aids to navigation. 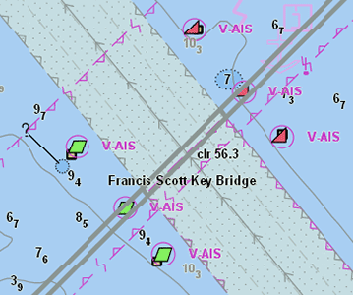 The images show a portion of the Francis Scott Key Bridge in Baltimore, Maryland, where six virtual AIS ATONs are used to mark the passage under the bridge. The three to the southwest are port hand lateral marks, the three to the northeast are starboard hand lateral marks. The V-AIS ATONs are shown with diamond shaped AIS "target" symbols. On an AIS enabled ECDIS, the blue diamond target symbols seen in the image above would be displayed on top of the V-AIS ATON symbols shown at left. 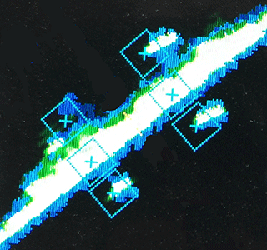 Note: This image and the EDCIS image above both show that the shore based AIS station is broadcasting the position of each of the outter V-AIS ATONs on top of (or nearby) the positions of each of the four lighted dolphins.